Operative healing requires you to micromanage in order to be effective. It requires you to keep track of your buffs on players,and is punishing if you fall behind. Anticipation, planning, and probes; that is Operative healing. I have found Operative healing to require somewhat consistent play to stay sharp, so I would not recommend Operative for your only healer that you play once a month. With time and practice Operatives can do amazing things. Operative is great if you enjoy details and refinement. It is a class that allows you can constantly improve, no matter how long you play it. Gearing is a topic covered extensively by multiple people, so the specifics will be left to them. The basic and necessary requirements boil down to the following:, over 1860 alacrity, but no more than 100 over, Around 2000 crit. Recuperative Nanotech - Heals the target and 3 others within 10 meters over 9 seconds. Instant. 10.4 second cooldown. This ability is fantastic. It is a smart heal, meaning it will place the heal over time on the target and the 3 lowest health allies within 10m of the original target. The HoT ticks quickly for small amounts, which maximizes effective healing. This ability is worth using on cooldown, or within a few seconds of the cooldown, since not only is it effective on 1 target, it is also a good way to get Tactical Advantages. Use frequently. Either on cooldown, or close to. Surgical Probe - Consumes a Tactical Advantage to heal the target for a small amount. Refreshes a stack of 2 Kolto Probes. Low energy cost. Instant. This ability is used constantly throughout a fight. Using a Surgical Probe to refresh a stack of 2 Kolto Probes has several advantages over refreshing with another Kolto Probe. One being it costs half as much energy as Kolto Probes, so it helps maintain energy. The other is that it heals as well as forcing the kolto probes to do a tick of healing, so simply more healing. There is one other aspect to Surgical Probe, the Curative Jolt proc. Curative Jolt is proc’d by Kolto Infusion and can only happen once every 18 seconds. This proc increases Surgical Probe’s critical chance by 100%, turning it into a huge heal. This automatic crit will be larger than a normal crit, and when used to refresh Kolto Probes, becomes a large, instant heal. The Curative Jolt proc lasts for 15 seconds, so Surgical Probe can be delayed until it is needed. As if Surgical Probe wasn’t great enough, every 10 seconds it will grant a Tactical Advantage too. Basically gives a refund on the TA that was used. About 1 of every 5 Kolto Probe refreshes should be done with Surgical Probe. Use consistently. I mean it, a lot. Kolto Infusion - Consumes a Tactical Advantage on use. With the Curative Agent utility, it will apply a HoT as well. Procs Curative Jolt once every 18 sec, increasing the critical chance next Surgical Probe by 100%. 1.3 second cast. 7.8 second cooldown. Another great ability, this is the single target heal that will be used the most. It heals for a good amount, has a good energy cost, and procs some amazing things. Kolto Infusion followed by the proced Surgical Probe is one of the operative’s burst healing options, and is able to be used every 18 seconds. When a target needs some single target healing, think Kolto Infusion. If someone needs a good chunk of health, Kolto Infusion and a proced Surgical Probe is the way to go. Kolto Injection - Heals the target, and generates a Tactical Advantage. The operative healing set bonus increases the critical chance by 100% once every 30 seconds. 1.73 second cast. Good for single target healing. The set bonus will turn Kolto Injection from a normal heal into a massive, super heal. Kolto Injection is best used when paired with the set bonus, otherwise it is generally outclassed by Kolto Infusion. If a lot of single target is needed, then Kolto Injection will be used a lot more, but it can drain your energy. Diagnostic Scan can help keep your energy stable in those cases. Use with the set bonus proc. Otherwise use sparingly. Use more if single target healing. Kolto Waves - Heals up to 8 allies within 8 meters over a 2.6 second channel. 8.7 second cooldown. Less useful than it looks in 8 man groups, but when in 16 mans, fantastic. This ability heals in quick, small ticks throughout the channel, so it does a really good job of healing groups of people quickly. Almost too much. The main drawback to this ability is that it will heal people to full life, which will cause any HoTs on the targets to overheal, and since there will always be HoTs out on people, this becomes a problem. This ability is best used when constant damage is being dealt to multiple people, or when multiple people are affected by DoTs. In those scenarios it allows Kolto Waves to heal the massive amounts that it does, while not quite able to keep people at full life, so your HoTs are still effective. Kolto Waves, and all the HoTs being able to do effective, meaningful healing is the Operative’s dream. Since Kolto Waves is a channel, it can be stopped at any time, so if one GCD of Kolto Waves is enough healing, it can be stopped after one GCD. In the event multiple people take a large amount of damage, but aren’t in immediate danger of taking more, Kolto Waves is tempting but not advised. In that scenario Kolto Probes, and your other HoTs will often be the more effective way, since there will be time for HoTs to heal the players up, without fear of them dying. Stopping Kolto Wave’s channel after one GCD is a middle ground, that lets both Kolto Waves and HoTs to be effective. I recommend using one GCD of Kolto Waves in most cases. In 16 man groups however, the amount of people in the group will spread out the healing done by Kolto Waves enough that over healing becomes much less of an issue. In 8 man groups, use sparingly, or for only one GCD. In 16 man groups, use frequently and smile. Diagnostic Scan - Heals the target for a small amount. Restores energy on crits. 1.82 second channel. Can be used while moving. Only useful for restoring energy. Nothing else. Use when energy is needed. Toxic Scan - Cleanses the target. Instant. 10.4 second cooldown. It is a cleanse, it cleanses some debuffs. Nothing fancy here. Use when a debuff needs removing. Kolto Probe - Heals the target over 21 seconds (18 seconds with proper alacrity). Stacks up to two times. Kolto Probes will heal for a good amount every few seconds. It is recommended to keep a stack of 2 Kolto Probes on each tank, and the two most likely people to take damage. Powertechs and Marauders come to mind. It takes two GCDs to apply a 2 stack of Kolto Probes, but only one to refresh it. Can be refreshed by either another Kolto Probe or Surgical Probe, and will be forced to do a tick of healing when refreshed. Kolto Probes will be more fully discussed in their own section below. Use always. Use the most. Stim Boost - Grants a Tactical Advantage, a boost to alacrity, and causes the nest Kolto Injection or Kolto Infusion to be cast instantly. Lasts 15 seconds. 1 minute 45 second cooldown. Stim Boost is the closest thing operatives have to a big healing cooldown. Being able to instantly cast Kolto Injection can be a life saver, especially when paired with the operative 6-piece bonus. Using the instant cast on Kolto Injection instead of Kolto Infusion is recommended because the cast time of Kolto Infusion is the same as the GCD, so it doesn’t have as much of an impact. The Tactical Advantage and alacrity boost are nice, but not very significant. Countermeasures - Lowers threat. With the Curative Agent utility it will make the next Kolto Probe apply two stacks at once. Lasts 10 seconds. 45 second cooldown. Only a healing cooldown with its utility. Being able to apply two stacks of Kolto Probes in one GCD is amazing, and with only a 45 second cooldown. This ability makes it much easier to deal with unexpected damage, and should be used often. Adrenaline Probe - Restores a large amount of energy. Lasts 3 seconds. 1 minute 45 second cooldown. Adrenaline Probe is the most reliable way to restore energy. In a scenario where all the energy was depleted, either intentionally or accidentally, this is the way to restore it. Relatively short cooldown, and do not be afraid to use it. Energy management will be covered in more detail in a later section. Medpack - Heals a large amount when activated, and a moderate amount over 15 seconds. 1 minute 30 second cooldown. The magic ability that sits in the inventory. Medpack is a great self heal that does not trigger the GCD, and operatives have the ability to stealth out, multiple medpacks can be used in a single fight. Medpacks are a great way to self heal, and should be used frequently. Be sure to remember to stealth out so that it becomes available again. Triage Adrenal - Increases Force and Tech power, and reduces damage dealt. Lasts 15 seconds. 3 minute cooldown. Shares a cooldown with the Shield Adrenal. The Triage Adrenal, more often referred to as the Healing Adrenal, is a good cooldown for when more healing is required. The Adrenal is a simple cooldown that does it’s job well. Keep in mind it shares a cooldown with the Shield Adrenal. Resuscitation Probe - Revives a dead ally. Useable in combat. 1.3 second cast. 2 minute 35 second cooldown. Triggers a group wide debuff that prevents similar abilities from being used for 5 minutes. This is the in combat revive. This ability with typically be used by a healer to bring back a dead ally. The power of this ability speaks for itself. Exfiltrate - Roll forward, grants a chance to dodge incoming melee and ranged attacks while rolling . Can be used again within 10 seconds before being placed on cooldown. 10 second cooldown. The famous operative roll. It is the staple movement ability of an operative, as it is a great way to get from one spot to another quickly. Triggers the global cooldown, so it should be mainly be used when walking is insufficient. Use it, and love it. Holotraverse - Quickly moves you to the target’s location, and grants a movement speed buff. Can be used on an ally as well as an enemy. Buff lasts 3 seconds. 45 second cooldown, 35 seconds if it’s utility is taken. Holotraverse is great for when large distances need traversing. When used it triggers a 0.25 second global cooldown instead of the normal 1.3 second. This ability should be used with caution as it is known to behave strangely, and can result in unexpected deaths, or exciting new places to visit. Shield Probe - Activates a shield on yourself when activated. Will heal for 5% of max health when it expires if it’s utility is taken. Lasts 10 seconds. 30 second cooldown. An off the GCD ability that shields for about 15k. Useful. It has a low CD so it can be used to prevent a decent amount of damage over the course of a fight. Evasion - Increases the chance to dodge melee and ranged attacks. Can also reflect specific abilities if it’s utility is taken. Lasts 3 seconds. 1 minute cooldown, but can be reduced with it’s utility. Evasion is either an operative’s best defensive or useless depending on the incoming damage. Evasion is wonderful for dealing with attacks that are not force or tech damage. This ability typically works well against adds, or normal attacks from enemies. The best way to understand what Evasion will work against is to try it on everything. Cloaking Screen - Leaves combat and enters stealth when activated. 2 minute cooldown, 1 minute 30 second cooldown if it’s utility is taken. Stealthing out will drop all threat, and send any hostile creatures to someone else. Great for saving yourself. As an added bonus, leaving stealth grants two Tactical Advantages, so it can be used either to drop threat or for extra Tactical Advantages. Shield Adrenal - Absorbs 30% of damage. Lasts 15 seconds. 3 minute cooldown. Shares a cooldown with the Triage Adrenal. The Shield Adrenal, or Tank Adrenal, is worth using as an operative. This Adrenal is the most well rounded defensive ability the operative has access to, and is useful in fights where the threat of massive damage looms. Keep in mind it shares a cooldown with the Triage Adrenal. Tactical Superiority - Grants a buff to all allies within 40 meters that grants 10% critical chance. Lasts 10 seconds. 5 minute cooldown. This is the operative raid buff, and should be used in tandem with any other raid buffs the group has. Raid buffs are typically used either at the start of the fight, when the boss is below 30%, or when the group decides a specific time. The two green bordered utilities should always be taken, since the top left will make you take less damage from AoE abilities, and the top center one will give you damage reduction. The grey border utility grants movement speed, so it can be useful on fights that take place in a large area. The green boarded utility makes your Adrenaline restore more energy. Almost always nice to have. 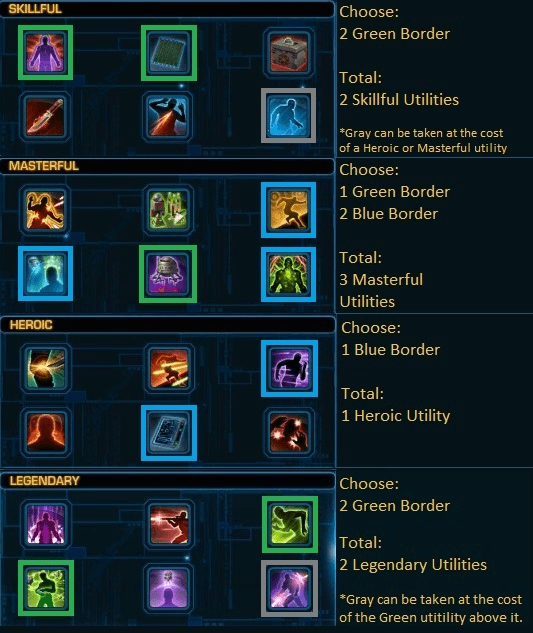 The top right utility with the blue border reduces the cooldown of your stealth out, nice when there is a threat of adds coming to hit you, or when a lot of stealth resurrections need to be done. The bottom left and bottom right blue utilities both increase your survivability. The bottom left will heal you when shield probe expires, a good general pick, where the bottom right will increase your damage reduction when you have Kolto Probes on yourself. If you will have Kolto Probes on yourself for most of the fight, the bottom right will be better, otherwise bottom left. You can even take both if you want too. The top right blue utility will reduce the cooldown on evasion each time you get hit, so in fights where you use evasion this utility is amazing, otherwise take the bottom center utility. That one reduces the cooldown of your shield probe, a good general utility. The bottom left utility should always be taken, since it turns Countermeasures into a healing cooldown. The most important aspect of this utility is the ability to place two Kolo Probes on a target with only one global cooldown. That is incredibly useful, and only has a 45 second cooldown. This utility also heals you over 10 seconds when you activate Countermeasures, which is a nice added benefit. The last thing this utility does is that Kolto Infusion’s heal becomes split into two parts, a smaller initial heal, and then a heal over time on the target. This is nice, as the HoT ticks quickly, and keeps with the overall theme of operative healing. The top right utility will heal you, and reduce the damage you take after activating Stim Boost. It is a nice defensive to have, but Stim Boost is mostly used for healing, so not the most effective utility. Better than other options. The bottom right grey utility causes evasion to reflect single target force and tech damage when activated, and deal 150% damage back. YOU WILL STILL TAKE FULL DAMAGE. This is an ability that can be used in specific fights, but is risky to do. If you want to play with reflect, expect to die as you learn what you can and cannot survive, and also expect to do some crazy damage. An important aspect of operative healing is planning ahead. Operative healing does best when you know who will be taking damage, so Kolto Probes can be already deployed before the damage goes out. It is best to think about who will be most likely to take damage, and how dangerous it will be, so you can be ready by the time any healing is needed. Predicting damage in a fight requires experience, and identifying how damage was spread out in previous attempts. Each group will take damage differently, but there are patterns to every fight. You will end up over healing people, but that’s normal. Always try and preemptively heal, because it becomes difficult to recover if you ever fall behind. In general there are two ways to go about healing a fight, either more group focused or more tank focused. Which style you will be the most effective is determined by the fight and your other healer. There are times when the majority of damage is dealt to the tanks, and when that happens Kolto Probes are only kept on the tanks, and Kolto Injection will be used more frequently. Using Kolto Injection followed by a Surgical Probe is a staple of single target healing because it only causes a slight loss of energy while still providing a good amount of healing. Using Kolto Injection regularly will drain your energy over time, so Diagnostic Scan will be used much more frequently than if you were focusing on the group. It is easy to deplete your energy pool when single target healing, and if Adrenaline Probe is on cooldown, running out of energy is very punishing. Always watch your energy. Being able to know when to transition from single target, to group healing is a skill that comes with practice. There are even times when you have to balance the two. Group healing as an operative boils down to managing Kolto Probes, which will be covered extensively in a later section. It is important to play off your other healer, to maximize both of your effectiveness and theirs. Being able to play well with your other healer is just as important as healing itself, but requires a lot of adaptability. Operatives excel at adaptability. Being an operative healer, you can transition from heavy group healing, to pure single target, and back again all within the same fight. You can even blend group and single target healing for when you want a little bit of both. Do the healing that needs to be done to kill the boss, even if it forces you into unfamiliar situations. Some groups and some fights will require you to push yourself in order to go above and beyond the expected, and that is what makes a good healer. I don’t include healers in the guidelines because keeping yourself alive is always important. That being said, you should become comfortable with how much damage you can take, and how to keep yourself alive. Because the lower you can put yourself in the priority list, the better you will be able at keeping the rest of the group alive. Medpacks are fantastic, as are tank adrenals. Energy management can be tricky, but becomes a lot easier if you keep a few things in mind. Energy regens faster while you’re close to full energy, so that is where you want to stay. There is about a bout a 20 energy window to play with before you have to worry about doing energy recovering rather than maintenance.The best abilities to regenerate your energy are Diagnostic Scan and Surgical Probe. Surgical Probes are excellent at maintaining and recovering energy. A Surgical Probes costs 5 energy is on the GCD, so there will be 1.3 seconds of energy regen at the same time. 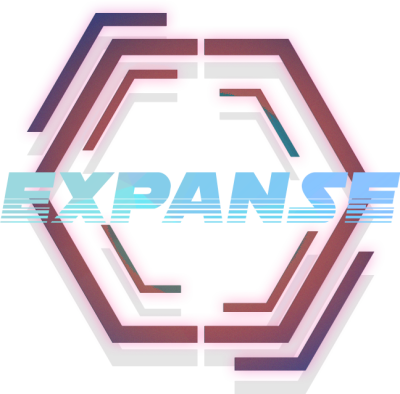 An operative will have about 7 energy regen a second, so (7 energy/sec x 1.3 seconds) - 5 energy = 4.1 energy gained (regen from other sources, such as Kolto Probes not included). So pairing Surgical Probe with energy negative abilities like Kolto Injection will go a long way in keeping your energy high. Diagnostic Scan will give you the most energy regen when used, but does very little healing, so it best used as a catch up tool. Diagnostic Scan excels when you are below half energy, or during periods of downtime. A useful way to help get the most of your energy regen is to use instant abilities before casted ones when possible. This allows the energy spent on the instant cast to start regenerating while the cast is channeling, keeping your energy higher. Lastly, Kolto Probes will regen energy when they crit, so more Kolto Probes will give you more energy regen to utilize. The abilities to most likely to drain your energy are Kolto Waves and Kolto Injection. Kolto Waves is an operative’s most energy demanding skill, so every time it is used you should pay close attention to your energy. Often times using Diagnostic Scan, or multiple Surgical Probes shortly after Kolto Waves will balance out the energy loss. Kolto Injection will only be a significant drain on energy when used frequently, so spacing them out is the best way to maintain energy. Using Kolto Injection, then Surgical Probe goes a long way to mitigating the energy loss from Kolto Injection. There are times where you are forced to drain your energy in order to put out the maximum amount of heals possible, and that is when Adrenaline Probe comes into play. Adrenaline Probe is the best way to recover a depleted energy bar, since with it’s utility it will restore over half your energy. A Diagnostic Scan immediately after Adrenaline Probe will almost always restore all of your energy. Adrenaline Probe is a fantastic safety net for if you accidentally get low on energy, but once it is on cooldown special care must be payed to your energy management. Because if you run low on energy while it is on cooldown, it is very punishing and will result in multiple Diagnostic Scans in a row. Tactical Advantage, or TA, is generated by heals from your Kolto Probes, Recuperative Nanotech, Kolto Waves, and Kolto Injection. Tactical Advantage stacks up to to three times. TA is also generated by activating Stim Boost and leaving stealth. Kolo Infusion and Surgical Probe require TA in order to use, and since those abilities are used frequently it is necessary to keep track of your TA. Surgical Probe will regrant the TA used every 10 seconds. It is also important to note that when a TA is used it grants a buff that increases your healing dealt. With the frequency Surgical Probe and Kolto Infusion are used, you will have the buff most of the time without much worry. Generating TA will happen naturally as you heal, but the trick is balancing how frequently you spend them. Using too many Surgical Probes will leave you without any TA if you aren’t careful. With practice, balancing TA generation and spending will become second nature. Probes. Probes. PROBES. YOU MUST PROBE THE WORLD. Kolto Probes are your bread and butter, as well as your meat and potatoes. They are the Alpha and Omega. You will succeed or fail because of Kolto Probes. Kolto Probes will be the majority of an operative’s healing done, as well as be a major source of Tactical Advantage, and energy. It takes two GCDs to apply 2 stacks of Kolto Probe*, but only one GCD to refresh, either with Kolto Probe or Surgical Probe, so most of the operative’s healing playstyle will be based around refreshing the 2 stack of Kolto Probes, or 2KP, before they expire. Most of the other abilities will be used in between refreshing the 2KP, and a good way to keep track of the applied Kolto Probes is to use them in 'Blocks'. A 'Block' is the GCDs spent only on applying or refreshing probes. A Block can realistically be between 2-8 GCDs long. I have found that keeping 2KP on each tank to be almost always essential, and keeping two more 2KP on other players to be highly recommended. It is reasonable to maintain four 2KPs in most fights, and is a good guideline to play by. Four gives a lot of time and freedom in between refreshing Blocks, while at the same time giving a good amount of energy and TA. However, there are times when there will be more than four 2KPs out at once, and occasionally you will have to let probes fall off to keep someone alive. An unfortunate reality to operative healing. When times are good, a lot of GCDs can be spent appling Kolto Probes, and a large refreshing Block is born. In many cases having a large refreshing Block is fine, since a lot of healing is not always need, but there will be situations where a Block becomes too large, and cannot be maintained. Once a Block begins to monopolize too many GCDs, you must make the decision of who will need the 2KP most, and how many you can keep. Then you let the others fall off. Knowing when and where to let the 2KPs fall off is just as important as maintaining the probes themselves. Each fight is a balance between the 2KPs, and the GCDs between each Block. For example, imagine I have 2KP on Tank A, Tank B, DPS 1, and DPS 2, for a total of four 2KP. I refresh the stack on Tank A, then Tank B, followed by DPS 1, then DPS 2. I then cast Kolto Infusion, then Surgical Probe, followed by channeling Kolto Waves as my Free GCDs. I then refresh the 2KP on Tank A, then Tank B, followed by DPS 1, then DPS 2. As shown above, the larger a Block becomes, the fewer free GCDs there are to work with. There is also the option of starting a refreshing Block early. This is ideal for when there is downtime, or a period of low outgoing damage. Entering a Block early will let you have your free GCDs when you need them. This can repeat this until other abilities are needed, in which case, the other pattern can begin right out of any Block. There will also be times when you are in the middle of a refreshing Block when suddenly immediate healing is needed. This forces you to deviate from the Block and shift directly into your free GCDs. For example, imagine I have 2KP on Tank A, Tank B, DPS 1, and DPS 2, for a total of four 2KP. I refresh the stack on Tank A, then Tank B. However at the same time DPS 4 is reduced to low health and in danger of dying. I then cast Kolto Infusion followed by Surgical Probe on DPS 4. Afterward I refresh the 2KP on DPS 1 and DPS 2 before they fall off. This scenario is why it is best to refresh your 2KP a few seconds before they expire rather than just before, because if you have a few second before the next 2KP will fall off that allows you to spend time on an emergency heal or two before resuming your refreshing Block. Therefore preserving your 2KP. Timing your refreshes this way gives a lot of flexibility, and is highly recommended for most fights. It is recommended to experiment with your Kolto Probes, and when you refresh them, because it is important to find a way that works best for you. The best way to find the limits of your Kolto Probes is play around with how many Probes you apply and how often you refresh them. Knowing who to apply Kolto Probes to is hardest on the first pull, but easier on the second. When first attempting a boss with your group, Kolto Probes should be applied based on expectations and past experiences. For example during the Dread Guards fight, in the first phase the tanks will be taking damage so they get Probes. The melee dps are going to be taking splash damage from the bosses, so they get Probes. These probes will be maintained for most of the first phase, conditions permitting. Now say you all died and are on attempt number two, and during the first phase you noticed that one of the melee did not end up taking much damage at all, so that melee won’t need Probes. You also noticed that one of the ranged took a lot of damage each time the AoE Lightning Field happened, so they should get Probes for the second pull. You should always strive to be more effective with each attempt. Predicting the people most likely to take damage is a skill that benefits mostly from experience. The more different situations you face, the better you will become at predicting the damage taken. Deciding who gets Kolto Probes boils down to whoever you think is likely to take damage. Since different people take different damage over the course of a fight, it is important to be constantly evaluating who you should maintain Kolto Probes on, and adapt as necessary. It is always better to put more Kolto Probes out than not enough, you can always let the extra ones fall off. Kolto Probes are so important because they will do more healing than any of your other abilities over the duration of a fight. Since they are such a powerful tool, optimizing their use becomes the most effective way to improve your healing. This, however, becomes very demanding, but equally as rewarding when executed well. Knowing when to refresh Kolto Probes early, when to refresh at the last second, when to use more, and when to let them fall off is difficult when in the heat of the fight. A lot of attention should be paidto how much more you can get out of your Kolto Probe usage, which means thinking back to previous pulls and identifying times when you refreshed too early or too late, and when you placed too many or too few. Improving your usage of Kolto Probes is the most difficult aspect of operative healing, and will require you to actively work to improve. Kolto Probes provide the base that your other abilities are fit into, and have such a high ceiling that there is no limit to how much you can improve your play. The following sections are focused on the specific ways some abilities can be used. There are a lot of uses and details that are hard to figure out alone, and these strategies come from both talking with people, and from personal experience. Operatives do have burst healing. It’s true. One option is Kolto Infusion followed by an auto crit Surgical Probe. Kolto Infusion will trigger the Curative Jolt talent, which will make the next Surgical Probe an automatic crit. This can trigger once every 15 seconds, which is about every other Kolto Infusion. The Kolto Infusion and auto crit Surgical Probe combination gives you a sizable amount of burst healing that can be used regularly. This is a staple of operative healing, and is your go-to burst healing option. The biggest burst heal an operative has comes from an auto crit Kolto Injection, granted by the 6-piece set bonus. This effect has a chance to trigger once a minute, and lasts until consumed or the effect expires. The time before this effect expires is fairly long, so it is important to keep track of it’s buff. Saving the auto crit Kolto Injection is not always possible, since there are times when Kolto Injection will need to be used, but it is important to try anyway. The auto crit will heal for an immense amount of health, and is very important to play around. This is your big burst, your ace in the hole, and should be treated as such. Stim Boost is not much burst healing in itself, but will help enhance your burst healing. Stim boost will make your next Kolto Injection/Kolto Infusion an instant cast, and since Kolto Injection has the longer cast time it is prefered. Having an instant cast Kolto Injection with the auto crit from your 6-piece, makes your best burst heal instant. Really great. Without the auto crit, the combination becomes much less effective, but still better than nothing. Stim Boost will work on its own in a pinch, but will excel when paired with your real burst. Precasting is when you begin casting an ability in anticipation of someone taking damage. The only ability worth pre-casting is Kolto Injection, since it is the only one with a cast time over one global cooldown. Precasting really shines when there is a large amount of predictable damage, like when a boss finishes a cast, or a timed explosive goes off. A great example of a fight where precasting is valuable is Tyrans in Dread Palace. Tyrans will cast Thundering Blast regularly, which does a large amount of damage, and can follow it up with even more damage. Instead of waiting for the boss to do the damage before you start casting your heal, you can begin casting at the tail end of the boss’s cast. So in this scenario, Tryans begins casting Thundering Blast, and once there is 1 second left in his cast, you begin casting Kolto injection. Since Kolto Injection has a cast time of 1.3 seconds, your heal will go off 0.3 seconds after Thundering Blast. This will prevent your target from being low health for very long, and reduce the risk of them dying to the next hit. Being able to precast well will reduce the amount of burst healing you will need to do, since it effectively gives you more time to heal. Healing the damage from an ability like Thundering Blast would require a large amount of healing quickly, but with precasting you can get an extra cast in, which makes big spikes of damage a lot less scary. Setting up your heal over time abilities on a target can be just as impactful as precasting, but is applicable in different scenarios. Setting up your HoTs works really well on targets suffering from damage of time debuffs or constant damage. A good example is the Cartel Warlords fight. In that fight one of the bosses, Horic spreads an AoE DoT on people. Making sure you have Kolto Probes on people before they get the DoT allow the healing to start immediately. It is also helpful to cast Recuperative Nanotech frequently on targets likely to take the DoT so that, chances are, once the player starts taking damage, they already have multiple HoTs healing them back up. Dealing with damage before it does out will allow you to better handle it, and give much more room do deal with the unexpected. For example, imagine you are prepared for players A and B to take damage, and have HoTs on them, but it is possible that B and C take the damage instead. You know that A and B are all prepared, so you only have to worry if C takes damage, therefore you can focus on player C once the damage goes out. This way you know who will need to be first when the damage goes out, and you can be ready to heal player C more than you would A and B. This can go a long way in dealing with damage that goes out, and allow you to react easier. There a few tricks to getting the most out of each Recuperative Nanotech. The most important aspect of Recuperative Nanotech to keep in mind is that it will heal your target, and the 3 lowest health allies within 10 meters of you target, so it is best to pick a target that allows Recuperative Nanotech to heal the most people. For example, if you wanted to use Recuperative Nanotech on person tanking the boss, you could cast it on one of the melee DPS, so the tank still gets the HoT, and gives Recuperative Nanotech more people to pick from at the same time. Another good way to get the most out of this ability is to use yourself to bridge the gap between people. If two people are 15 meters from each other, you can position yourself in between them, and cast Recuperative Nanotech on yourself, allowing it to hit both people, instead of just one. Being able to see opportunities for this strategy, comes from being able to see a 10 meter circle around yourself, and then trying to fit three other people in that circle. Eventually you will be able to get a sense of how Recuperative Nanotech will spread before you even cast it. There are a few specific times when using multiple Surgical Probes in a row on a target is beneficial. The most common one is when you are forced to do a lot of moving. This allows you to maintain decent single target healing while moving, but it cannot be maintained for long. The other, hopefully more rare, case is when someone is in immediate danger of dying. The threat of them dying is so great that you aren’t sure if you will be able to get a cast off in time, so you can spam Surgical Probes on them. The goal behind this is to attempt to keep your target alive long enough for the other healer to stabilize them, since Surgical Probes alone will not save them for long. Just keep in mind that this will drain your Tactical Advantages, and that a good way to get them back is to stealth out, which gives 2 TA after you leave stealth. Personally, I am not a fan of DPSing as a healer, but there are times when it is needed. In fights where not a lot of healing is required, DPSing is a good way to use your extra GCDs. Corrosive Dart is your best DPS move, it does a lot of damage, only takes one GCD, and doesn’t cost much energy. In fights where you have to DPS, keeping Corrosive Dart up on the target is a good way to do damage. If you are in melee range, Backstab is a great damage ability, and the third best damage ability is Shiv. Those three abilities are your best options when it comes to single target damage. When area of effect damage is needed, Toxic Haze is your go to ability, followed by Fragmentation Grenade. Operatives can do some good damage as a healer if they are in melee range, but it is easy to deplete your energy so caution is advised. A Stealth Res is when you stealth out and use your out of combat revive ability on a dead player. That means you must remain out of combat for the duration of the revive cast. The following rules will help prevent yourself from being pulled back into combat. You must have the Revive ability on your action bar, and use it from there. You must not have any heal over time abilities on yourself or anyone else. You must not have any damage over time abilities on any enemies. Make sure a Sorc doesn’t use wandering mend. Try to time it so no adds spawn while you are reviving. Being able to consistently be able to Stealth Res requires practice and a specific set of conditions. The best way to get feel for it is to do it. Performing a Stealth Res on an operative healer, while useful, is fairly annoying. When you are focused on keeping Kolto Probes on people, having to let all of them fall off before you attempt a Stealth Res is a special kind of pain. So learn how to Stealth Res, use it when needed, but be sure to complain just a little bit. This became a much larger and involved project than I expected, but I am pleased with the result. It is impossible to include everything, so I tried to include as much as I could. Healing is a very fluid role, and resists concrete rules, which is why I encourage experimenting, and finding what works best for you and your play style. A healer has to do whatever needs to be done to defeat the boss, and should always try to be better than the pull before.